Special thanks to Robin Dennis and Mary Grace Corbin for coordinating efforts in Jackson to turn the town teal. Robin is designing new banners to go along side the banners displayed yearly in September and Mary Grace is on her way to making teal bows to add to the teal ripples. We are also working with Lamar Outdoor advertising for a new billboard vinyl. Thanks also to Subway for sharing their billboard space with us each September. Local businesses are encouraged to add a touch of TEAL to store front displays during the month of September to support Ovarian Cancer Awareness Month! Stop by the Aiken Downtown Development Association office on The Alley and get a sign to display showing your support. Prizes will be awarded. Special thanks to the Aiken Downtown Development Association for supporting this addition to our awareness campaign. AIKEN, SOUTH CAROLINA: Mark your calendar for September 1, 2016, at 7:00 AM to watch as we turn the water teal for the month of September. Special thanks to the Aiken City Council for approving our request. GFWC Georgia Junior Clubs Special Project "Listen to the Whisper"
Receiving an invitation from Director Sandy Ahearn to be guest speaker at the Institute breakfast meeting on August 21 is indeed an honor. Director Ahearn's theme for the year is "Listen to the Whisper" and Debbie Mills, founder of Gail's Anatomy, will be speaking about ovarian cancer. Returning to the hometown of Gail's favorite football team and to speak about ovarian cancer to a group of ladies from acroos the state of Georgia will be an amazing opportunity to make an impact in awareness, early detection and ultimately saving lives. What a positive change that will be in the communities across Georgia. Nationally, the General Federation of Women's Clubs group is nearly 100,000 members strong and is united in its dedication to volunteer community service. While diverse in age, interests, and experiences, all clubwomen are united by a desire to create positive change in their communities. AIKEN, SOUTH CAROLINA: July 11, 2016 brought Alicia Owens and Debbie Mills to the Aiken City Council to request approval of turning the Newberry Street water fountain teal and hanging teal bows in downtown Aiken for the month of September to bring awareness to Ovarian Cancer. The Council unanimously approved the request and also proclaimed September 2016 Ovarian Cancer Awareness Month. We appreciate the continued support of our local government to bring awareness to the citizens and visitors. We also appreciate Tim Coakley and his crew for maintaining the teal water fountain throughout the month. Aiken (SC) City Council, Aiken County (SC) Council, and Gov. Nikki Haley proclaimed September 2015 as Ovarian Cancer Awareness Month. Gail's Anatomy is honored to work with our government officials to bring much needed awareness to this disease. The beautiful palmetto frame and matting on this wall hanging was donated by Connie's Framing on Park Avenue in Aiken, South Carolina. 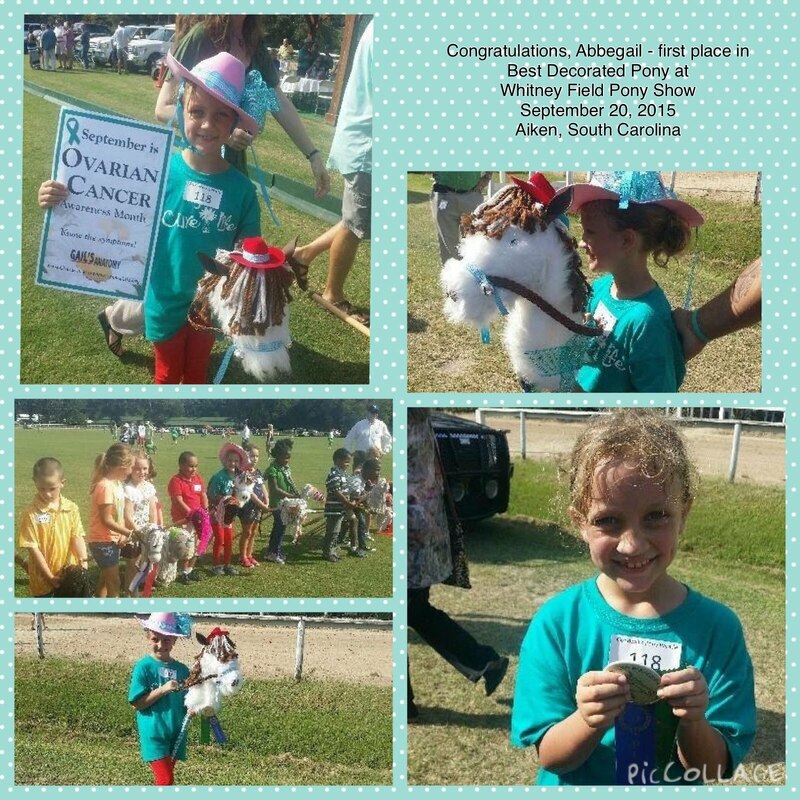 Aiken, SC - The creativity of 8-year old Abbegail determined to ride for ovarian cancer awareness and in honor of Gailcan't won the first place ribbon for Best Decorated Pony at Sunday's wooden pony show. We are so proud of you Abbegail for decorating your pony in teal and sharing the signs and symptoms of ovarian cancer with the polo crown at Whitney Field in Aiken, South Carolina. COLUMBIA, SC - South Carolina Governor Nikki Haley proclaimed September as OVARIAN CANCER AWARENESS MONTH. On September 10, 2015, the proclamation was presented to Alicia Owens and Debbie Mills, co-directors of Gail's Anatomy, by Rebecca S. Schimsa, Deputy Legal Counsel, Office of Governor R. Nikki Haley. Gail's Anatomy is excited about plans being made for 2016 --- you WILL see teal nearby. Thank you Gov. Haley for promoting awareness throughout our great state.